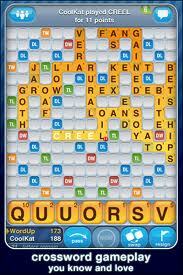 Words With Friends is one of the apps on my home screen. The home screen of your iPhone is prime real estate. Only the best of the best apps end up there. My home page has the clock, photos, text messages, iPod, and calendar apps plus ICS (In Case of Emergency), Facebook, Dragon Search, Awesome Note, GetGlue, MapQuest, EverNote, Kik, some social apps like Twitter, Duo for iPhone, Foodspotting, Instagram, Skype; and the main bar at the bottom which includes Mail, Phone, and Camera. If you don’t play Words With Friends you may be wondering what about it makes it worthy to be on my home screen. Words With Friends is basically a free Scrabble knockoff. To buy Scrabble as an app on your phone you’d pay like $5 I think. You can play Words With Friends for free on an iPhone or Android or buy it to get rid of the adds for like $3 (I think) or you could do like I did and wait for it to go on sale for 99 cents. Every night before I go to sleep I play my Words With Friends turns. Everyone is addicted to it. Even Jason Bateman talked about his Words With Friends addiction on Late Night with Jimmy Fallon. Anyone know his screen name? I’d love to play him! I have about 15-17 games going at any given time. I play with friends and their friends. For instance I play with my Virtual Twin Deb and her sister in law. Her SIL kicks my arse 9 out of 10 games. Come to think of it, Deb kicks my arse 9 out of 10 times. But playing them has made me a better player. I get scores now I never used to achieve. I love how Words With Friends has a chat feature too. Helps me keep up with my peeps. My screen name is iShanny if you wanna play!